As we often have guests departing the day you arrive, we cannot allow early check-in or storage of luggage in the room before 3pm on the day of arrival. Please consider booking previous night if you have an early arrival. Please report missing, broken, or damaged items immediately to local contact Ryan, 808-589-7126 (local call from your room). The condo was everything we expected. Clean and nicely furnished with adequate number of drawers. The vanity is a very nice feature and two way entry to the bathroom from the living area and the bedroom is a great feature.. The sea view is lovely. Having the dining table near the sliding glass doors to the lanai makes it very pleasant. I had requested a small roaster to roast meat and chicken and it was there before we arrived. Thank you very much. We cooked most of our meals. We like the quiet end of Waikiki, yet not removed from activity and the bus is very handy. Also it is easy access across the bridge to the Cinnamon restaurant where we occasionally ate. we would gladly stay there again. The grocery store is a short distance away. It is fully stocked for all the permanent residents who live around there. We had a great time in this condo. We were traveling with the family and rented 3 condos for us during our stay. And on the three condos, it was the best. For its parking full foot to bring back the shopping, for its door with closing code very practical, it is decorated with taste, a lot of storage, it was able to make nice family meal because very very well equipped with dishes, utensils and the pleasant lounge chair in bed for children. We enjoy this condo 790, thank you to the owner for this service. The condo has a beautiful view of the marina and ocean. It was clean, other than a few spots on the rugs and throw pillows. The owner just had put in a new kitchen and it was quality and very beautiful! The bed was extra comfortable as well. I only mention the spots on things because I also have a vacation rental on the Big Island and unless renters tell me about issues, I wouldn't know.Thanks for the beautiful stay! Unit 790 was a wonderful stay for the price. The owners were responsive to all our questions, the unit was clean and easy to get to. The view was incredible! Enjoy! Beautiful ocean view, comfortable king-sized bed, clean everything, newly renovated kitchen... It was our 3rd time in this particular condo - a wonderful "home away from home." Woke up to the sound of birds:) Loved the luxury of making our own breakfast and sitting at the dining table - looking out at the waves, the sailboats. Enjoyed the sunset while eating leftovers for dinner. Got to see the Friday night fireworks at the Hilton, and then a few days later more fireworks (probably for a private party). We used the cooler, the beach towels, the beach chairs, the nice shopping bag, the hairdryer. Liked parking on the 7th floor so that we didn't need to use the elevator to get to the condo. It's not too noisy on the 7th floor (from restaurant/bar patrons on the 1st floor). Parking has gone up to $23 a day, but still better than paying at a hotel. Also, it's great that we're not charged a resort fee, which is charged at hotels. Laundry room is just 1 floor above. Gillian and Vlad were very responsive to my questions. What a lovely condo in a nice area.The views and sunset are spectacular.The bedroom can be closed off with a sliding door. The whole rental was done with Email and went very smooth. *There is a Chart House restaurant just below, so can be bit noisy. We have stayed here two times, will probably stay many more, the ownersAre very responsive and generous. My wife and I arrived at the condo at about 10pm after a very long flight. We were ready for a good night sleep. The bed was out of this world, so comphy and we had a fantastic sleep each every night. When we awoke and opened the curtains what a beautiful view. Everything you could think of was supplied throught the condo, bedroom, living room kitchen and bath was more than we expected. Gillian was so kind to send us a photo from the condo before we left Calgary. Thank you so much, we will for sure use your place when we return to Honolulu. Larry and KarenCalgary Alberta Canada. We recently stayed in Condo 790 at the Illikai Marina . Apart from some plumbing problems which were fixed extremely promptly we had a wonderful stay.Ryan, the local contact ,was very helpful and easy to deal with.The condo looks exactly as portrayed in the photos. The view is lovely and the condo is spacious. Illikiai Marina is located next door to the Modern Hotel and The Illikai Hotel. There isn't a pool but the beach is a five minute walk. It is not crowded like the main beach in Waikiki so far more pleasant to swim and relax. Buses to everywhere are in Ala Moana Blvd ( 2 minute walk). It is only a 15 minute walk to the main district of Waikiki and ten minutes to The Ala Moana Centre which is great for shopping. Most tour buses pick up from the Illikai Hotel which again is just a 5 minute walk.I would recommend this condo if you want to stay away from the mayhem of central Waikiki.Thank Gillian and Vlad for all your help and hospitality. All in all it was a very nice stay. You can't get a better location for the price. The condo was very well equipped, including inflatable floats, pumps for them and even beach towels. There were a few downfalls. The kitchen certainly needs updating. The counters are cheap and old. The microwave is terribly situated for use. Do not attempt to use the drawers in the buffet without being aware that they could very well fall on your foot. Finally, the kitchen floor should be replaced. The only other problem was the dining table. It is a glass topped table that is not secured in any way. If you put any type of weight on it you lifts up. We came close to a dangerous event more than once. Again, It is a good place with a great view and in a super location. The Harbor Pub on the street level is a fun place full of locals and marina slip holders. The other people we met who live in the condos were all great. The 'buffet' is a valuable Tibetan antique, which does not have contemporary drawer stops. The drawers have not fallen out before. The kitchen floor is the same attractive porcelain tile as installed throughout the unit during recent renovation. While the location of the microwave has not been an issue we will explore other possibilities. The dining room table top is not attached to the base due to inherent design to provide more transparency and unobstructed views. The safety of the table has not come up before and we will look to possible remedies. As correctly stated in the review "you cannot get a better location for the price" That is something we strive to provide - an attractive location for a reasonable price. We had two and half weeks vacation in Honolulu and for the first 4 days, my family and I stayed at Condo 790. Many of our other family members who also traveled from NZ to Honolulu and stayed in nearby hotels, indicated to me of the disappointments they felt over their accommodations. My family and I, on the other hand, were very satisfied and happy with ours. The Condo was the perfect home away from home, being that it was conveniently located at the intersection of Alamoana and Hobron and therefore close to Alamoana Shopping center, to ABC mini mart, to Mcdonalds, to all the buses that run on Alamoana and some even stop right outside Ilikai Marina Condos, and of course to many walking distance restaurants and other great places to eat. During the day we would hop on the buses and we'd go out sight seeing or do shopping, and at night we'd come back to the condo absolutely tired from our adventurous day. And the condo was a welcoming place everytime we stepped in. There is aircon, a bathtub and an overhead shower, clean towels and lots of spare towels if your children enjoy going to the beach everyday. The kitchen is also fully equipped with everything that you would need to make a meal for a family with children. The view from the Lanai is breathtaking and it is exactly as shown in the pictures. Thank you to our hosts Gillian and Vlad for making our first impression of Waikiki Honolulu a great one. We would recommend this Condo to any Kiwis visiting Hawaii, you will not regret it. Our family enjoyed our stay at Ilikai Marina Confo 790. The unit is compact but clean and comfortable. The view of the marina and water is lovely. We enjoyed the beautiful sunsets. The location is great being only a reasonable walk from Waikiki and close to Ala Moana shopping center. We would gladly stay here again if we were to be lucky to be back in Honolulu. We stayed here with our son and found it to be an excellent location, handy to the beach, and the lagoon (in front of Hilton) which is perfect for young children. It's also an easy 10 minute walk to the Ala Moana Centre, if you fancy a spot of shopping.The condo met our needs in every way. It was well equipped and clean.We enjoyed overlooking the marina and had views of the lagoon and ocean in the distance.Would definitely stay here again and highly recommend to others. Best Condo, Best View, Best Price! My mom and I come every year to Honolulu from Alaska. We stayed at many condos, but this condo is the best of all and we plan on staying here again! Condo is located in quiet and safe part of Waikiki, which means no noise at night. Condo is located next to Ilikai hotel and Hilton Village, area is clean, has beutiful landscape architecture, fountains, restaurant, cafes, and stores(everything you need). We walked only 20 minutes to downtown Waikiki, but you can also take the bus. Condo has STUNNING view of the boat harbor, ocean and the beach! View sunset from your balcony! Condo is well designed with beautiful furniture, lamps, and is equipped with kitchen, bath and bed supplies (Microvave, toaster, coffee maker, extra blankets, towels) Host also provided beach chairs, umbrella (A Must! ), and other beach items that were really usefull on a hot day! Hosta Gillian and Vlad are beyond amazing! Very friendly, helpful and thoughtful people who are there to make your stay amazing! I enjoyed staying in touch with Gillian, she answered all of my questions and replied quickly to emails. We could not thank them enough for making our vacation easy and relaxing! This is our favorite condo at the Marina. The kitchen is fully equipped. The layout is perfect and we enjoy the table being close to the window to enjoy the evening meal while watching the sun go down. The living room is very comfortable. The bed is wonderfully comfortable and we enjoy the direct entrance through the vanity into the bathroom from our bedroom. Really appreciated being able to get c-span on the television. Grocery shopping is convenient at the Food Pantry about three blocks away. All in all, we are entirely satisfied with this condo. Owners are very nice to deal with and are willing to please any way they can about a request. We were most pleased with our stay at condo #790, it was clean, supplied with everything to make our stay comfortable, it was centrally located to all the shops, restaurants and a bus stop only a few steps away. The views from the condo are beautiful. Having two restaurants and a pub in the building made it so convenient for the days when you were too tired to go out after a long day of tours and activities. We will definitely be back to stay in the same unit, thank you so much for everything. We have stayed in several condos in the Ilikki Marina and this one is about in the middle range. Nicely updated except the kitchen. Not enough supplies for our 12 day stay. We left some supplies the next guest could use. The air conditioner was difficult to adjust. It was on constantly. We could of used more towels and washcloths. Also, the kitchen had no dish rags; only one sponge and two dishtowels to clean up things.It was the most quiet floor we had stayed on and we appreciated that. we would stay in this one again if the nicer ones weren't available. This is the second time we've stayed in this particular condo. We like the location of the Ilikai Marina - within walking distance of Ala Moana Beach, Waikiki, and it's an easy drive to from Honolulu.The ocean view is refreshing. There's regular and handicapped parking on the 7th floor - by parking on the 7th floor, we could just walk into the hallway without waiting for an elevator.It also helps to be some floors above the restaurants below - there's some noise from patrons late at night.We like having a full kitchen, living room, dining area, handy laundry room one floor aboveThe King sized bed is comfortable. We stayed here for a week for a wedding that was across the street so location was very convenient. The check in and check out process was efficient and great to have access to the property management contact details if need be. We would definitely stay here again as it was clean, spacious for the price and the view from the balcony is bonus. Aloha! Really enjoyed my stay at the Ilikai Marina! Will definitely visit again. Enjoyed my stay at Condo 790.The front door combination lock was fast and efficient.The A/C Unit was set perfect for the weather without being overpowering.The trash chute hours could have been opened earlier for those leaving earlier.The unit was very clean with ample trash cans and cleaning equipment available.The only drawback with this unit is the unavailability of the Fox News Channel and other korean and japanese channels. I definitely recommend staying at the Ilikai marina condos! It is tucked away from all of the motels along the waikiki beach, so it is quiet. Though it is still close enough to walk. The condo itself was everything we needed and more. It was just me and my wife though. I wouldn't recommend staying with 2+ children, it is small. Thanks again! My wife and I recently enjoyed 2 weeks in Hawaii , the last week staying in Condo 790. This one bedroom unit is ideal for anyone looking for a well equipped condo with easy access to Waikiki Beach...within short walking distance.The view of the marina and ocean is just wonderful and you can also view the Friday night Hilton Hawaiin Village fireworks from the balcony.The unit is well furnished with everything need to do your own cooking and also has 2 nice restaurants in the building. Parking is easy and the condo is located in a great location next to Waikiki Beach. Outback Steakhouse and Red Lobster are located literally next to the condo and the condo location well located to explore downtown Honolulu.The unit has a new A/C system , a nice fan and a comfortable bed and couch and TV in living room and bedroom. If you are looking for a nice condo at a reasonable price where you have cooking available I would recommended checking out this condo. The view of the ocean every day just adds to the experience. WE really enjoyed the condo, its in a great location and everything you could need. Having the lawn chairs and umbrella were a great extra too. We will definitely stay here again and hope we can return soon. We have been to Waikiki many times, this is certainly one of the nicest places we've stayed. Very quiet, never heard a neighbor and always viewsof Marina, boats coming and going all the time. Quick walk to the beachat the Hawaiian Hilton or Don Quixote if you to care to eat at home.Will return. We enjoyed wonderful sunsets from the window. Wonderful sight !Hope the pillows will be replaced by non-smelling ones They smelt fatty oilish old man. If you had contacted us during your stay the pillows would have been replaced immediately. Incidentally, the guest who checked in after you and has been staying the last 9 days was not aware of any odor from the pillows. We are so glad to hear you enjoyed your stay at the unit 790 at the Ilikai Marina. Thank you for commenting on the smooth transaction as we do try very hard to keep things convenient and easy for our guests. The views, the location and condo is a good choice when it comes to having all you need for your vacation. We hope you will come back again soon. The condo was wonderful, everything was great, thank you so much. We stayed here after 10 nights up in Makaha. Great for 2 adults and 2 kids.An easy walk past the Hilton Village along the beach, or a cheap taxi ride to the hustle and bustle.We ate out, but the kitchen was well appointed. The view over the harbour is nice.I would recommend this condo to friends. The Ilikai Marina Condo 790 was the perfect accommodation for my wife, infant daughter, and mom. We couldn't have asked for a better view and the location was within walking distance to the lagoon pool and Fort Derussy, where my wife attended a medical conference. It was definitely a great value and I'd recommend it to others. The unit had everything needed for a nice stay. Sunsets over the marina were delightful. Very clean unit with a very comfortable King bed. Kitchen was well stocked with all appliances and utensils that made meal prep easy. Stayed two weeks and enjoyed every day. Short walk to beaches and parks. Fabulous view from the lanai of the Hilton fireworks show every Friday night. The communication from the owners was fantastic. Very nice people to work with. When I go back, I hope this unit is available. Thank you for taking the time to post a wonderful review for the unit 790 at the Ilikai Marina. It certainly is a perfect location right in the middle of all you want or need. As you mentioned the views are something special and the sunsets are what memories are made of. We hope you do come back sometime in the future and thank you for your referrals to friends and family! Mahalo for your great review! We so appreciate you taking the time to respond and give us your feedback. We are always happy to hear when our guests had a pleasant experience in our units. This complex is very centrally located as you mentioned and is so very convenient to everything. The views from the unit are exceptional and the unit does have everything that one will need. We are glad to hear that you will stay with us again on a return trip. Mahalo for your business! Excellent location, well maintained and comfortable condo. Everything was provided, from linens to beach towels. The view was incredible. The apartment is in very quiet area with easy access to shopping, recreation and transportation. In one word, we had an awesome experience. Beautifully well furnished condo with amazingly breathtaking view. Ilikai Marina #790 awaited us with a view that was no comparison to the photos. It was breathtaking, soothing & relaxing for us during a stressful time, whereas we needed a getaway for some R&R. Everything we needed in your condo was provided. The king bed was extremely comfortable, condo beautifully furnished, very spacious. We loved our short morning walks to the beach & chatting boat boat owners in the harbor. We also loved that your condo was not in the heart of the busy streets Waikiki, and it was only a large block away from Ala Moana Shopping Center. My husband & I have already decided that when we return, we will not look anywhere else to rent, but will come back to your lovely condo. Wow!!!! - what can I say? Perfect. The location was perfect - The condo was clean and exceeded our expectations...much better in real life....just a short walk to the Ala Moana shopping centre, or catch the bus or trolley from just around the corner for $2....restaurants nearby and a lovely food court at Ala Moana. We loved the king size bed and everything about the condo. The view just blew us away every time we entered the room. There is a fireworks display every Friday night at the Hawaiian Hilton village and we had a birds eye view from the lanai. The pub downstairs provided a happy hour from 3-7pm and the food there was delicious. We preferred this area rather than the busier touristy end of Waikiki. I would return there in a heartbeat. Just a reminder not to leave shoes etc in the corridor..we removed our shoes due to a walk along the sandy beach and got a note saying if it happened again we would be fined $50. We thoroughly enjoyed our stay at #790 Ilikai Condos. Everything we needed was provided. The position is perfect, bus and trolley stops around the corner and of course an ABC shop/mini supermarket and plenty of restaurants nearby. Best value and food was the grill bar at the Ilikai Hotel. It's an easy walk to the lagoon and the rocky end of Waikiki but be prepared for quite a hike (in the hot sun) to get to the main Waikiki beach - better off catching the buses.Fabulously comfortable bed!The balcony (Lanai) really is teeny weeny but we still had fabulous views, including the Friday night fireworks, courtesy of the Hilton hotel. We loved watching the yachts, canoes, surfers, cruise ships and more go sailing by everyday.The only small problem we had was finding the place as the address is misleading, it is actually on Hobran street, not Ala Moana Bld!! Took our shuttle driver on quite a tour trying to find it, luckily he was very patient and determined to find it for us, even tho it was quite late at night! This condo was an excellent choice, thank you! Beautifull view and immaculate surroundings within. First time renting a condo. Enjoyed everything. Nicely furnished. Bed was comfortable. View was spectacular. Staying at unit 790 at Ilikai Marina was one of the best parts of our vacation. Every time we walked in the front door, the view overlooking the marina and ocean knocked our socks off. The unit was clean, well-equipped, and quiet. They even provided free wifi, beach chairs and toys, tennis equipment and a filtered water pitcher. The owners responded quickly to questions and kept us well-informed from the time we booked until the end of our stay. It is a great location, everything within walking distance--beaches and good restaurants. We especially liked the ala Moana Beach Park and the Chart House. We loved it and would definitely stay again! Great location, awesome view and very comfortable. We stayed for seven days with our son and daughter in law. The king bed was very comfortable I will say and my son said the pull out did the job nicely for them. The view of the marina and the lagoon was nice. Parking for our rental was secure and easily accessed off a quieter street than most in Waikiki. Having the recycling bins and the garbage chute on the 7th floor was very handy in keeping up with both. We used the laundry on the 8th floor and found it very quick and easy to get to just up the stairs. the laundry room was equipped with good clean and well functioning machines. The parking garage team was very friendly on every occasion which is a nice touch. The unit was clean, smelled fresh and suited our needs perfectly. Everything worked as it should and we wanted for little other than we had. Like almost every where in Waikiki there was a handy aBC Store right across the street for keeping up with beverage basics and with the car we easily drove to other shopping areas as needed.We watched our son and his wife para-sail right from our lanai and they left from the marina below.So again the location was very good. Clean & Comfortable with Good amenities! This was our very first time renting a condo during our vacation to Hawaii. We are very happy with our choice to rent this apartment. The apartment was clean, safe, and had plenty of dishes and small appliances (coffee maker, rice cooker, toaster, blender, tea pot, microwave), and beach gear (beach towels, portable chairs, a boogie board, small cooler) to help make our stay a wonderful one. Internet connection in the apartment was a plus. Being able to do laundry just one floor above us was very helpful to keep our towels, beach wear, etc. clean and ready for the next day's fun at the beach. After the first week of our stay, we received a full cleaning service in the apartment. We had plenty of parking space on the seventh and eighth levels for our rental car. Access to and from the garage is very easy from the apartment. Located just around the block are Red Lobster, Outback Steakhouse, McDonald's and the aBC store. Just a couple blocks away is the ala Moana Shopping Center. The only things that were least liked are the somewhat dated cabinets, the small lanai, and the sliding shower doors that made it tight when bathing a small child. But these minor setbacks did not hinder us from enjoying our stay. The apartment can comfortably accommodate a small family. There were three of us staying in the apartment (2 adults, 1 small child). The apartment has a full-size refrigerator, stove and oven, and bathtub, which were amenities that drew us to choosing this place. Thank you so much for a wonderful stay! I took advantage of three times this room ever.So, I was very relaxed feel like coming back to "my room".I think I want to go back to "my room" again next year. The condo #790 at the Illikai Marina was perfect for our 7 day stay. It had everything we needed. The condo itself was clean and decorated nicely. The reason I didn't rate it excellent was because of the lack of a personal washer and dryer in the room. There is a facility on the 8th floor for the buildings use. Also the lanai is very small and barely fits 2 people. But with that said, the view from it for the sunsets and overlooking the marina is spectacular so that is very minor. Also the building does not have a swimming pool which is always nice for gathering with friends in the evening so we did miss that. The building has 24 hour security which is always a plus anywhere in Honolulu. Even though it says it is a non smoking building there is a separate area outside that they provide for you which is situated where it doesn't bother anyone. The Illikai location is perfect for everything. Close to shops and getting groceries at the aBC superette across the street. Its an easy drive to larger grocery stores as well as easy acess to anywhere. A short walk takes you to all the activities that surround you. Just across the street is the beach boardwalk that takes you to the Hilton, about a 10 minute walk if that, and all of Waikiki, depending on how far you want to walk. We utilized the different hotels beaches, restaurants and bars along the walk. The Hale Koa is a great place to sit and have a cocktail and watch the sunset and the fireworks from the Hilton on Friday night. All in all it was a great place to stay and condo # 790 is perfect so that is what I would rate as excellent, (minus the washer and dryer comment.) The booking transaction was easy and the owners keep in contact via email with all the directions and instructions that make it all go smoothly. The property manager is easy to contact if the need arises. I would definitely book this unit again! Had a nice stay at 790. Awesome ocean view. Easy access to the ala moana surf spot and the Hilton lagoon. Fun spot. Fairly quiet too. Best for 2 people, although we had more. Parking is $20 a day but you can park on the same floor (7). Easy access to ala moana shopping mall and park. I started jogging daily through the park before I left.Abc store close by for towels and food. 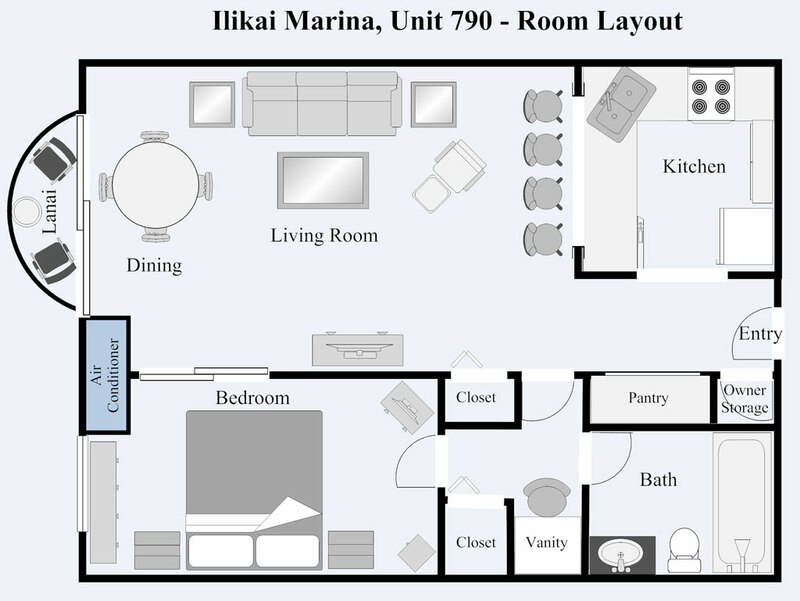 We chose Ilikai Marina 790 to stay on our holiday for several reasons - we wanted a fully equipted apartment/condo, we wanted a waterfront view and we wanted to be close to the bus routes. This Condo was perfect. It matched exactly the photos and description on the web site. We had been a bit concerned about checking in as we did not arrive at the Condo until late at night, but we were met by the Security lady who took us up to our Condo and familiarized us with where to put the rubbish etc. The view of the Marina and out to sea was fabulous. It was so enjoyable to have our breakfast each morning just watching the comings and goings at the Marina, the Submarines being towed out each day, the surfers trying to catch the waves and the tourist ships going past. We even ate "in" several evenings just so we could enjoy the view, especially on Friday night so that we could have a birds eye view of the fireworks display. The location of the Condo was great for catching buses as the bus stop was just around the corner outside the Ilikai Hotel. The ala Moana Mall was only 10 minutes easy walk away where we did all our grocery shopping at the Foodland Supermarket which is alot cheaper than the aBC stores. Unfortunately there are not as many restaurants in the area as there are in downtown Waikiki, but we found at least 5 within walking distance. The Red Lobster was excellent, and the Charthouse downstairs in the Ilikai was good value. We also found a "Sports Bar" restaurant in ala Moana Blvd across the road from the Ilikai Hotel which had good meals and there was an asian Restaurant further along ala Moana Blvd. We are not "beachy" people so did not need to be close to the beach, but the beach was only 5 minutes walk when we did want to go. This was the best holiday we have ever had and we both wish we had booked for an extra week. We would happily return again to stay in Condo 790 and thank Gillian and Vlad for making our holiday so enjoyable. We loved the code locking front door, the well-equipped kitchen, the 2 TVs, and the view. I would recommend this condo to a family of up to 4, if 2 sleep on the fold out sofabed. We used the 4" topper to make it more comfortable, but then had to remove this layer to close the sofa.Better for a couple. Plenty of drawers. Clean, with no bugs. Hilton lagoon provides safe swimming within walking distance. No pool.Plenty of parking on 7th floor, with handicap stalls always available, and a whole area free, up a half-level.Vlad was helpful in measuring the doorways, but we do not recommend this condo to anyone who uses a wheelchair and walker. Owners did not claim to be aDa compliant. There is not enough clearance to roll at the foot of the bed, and the glass doors in the tub-shower impede bathing. We bought our own shower chair at Don Quijote store, which helped. Also the bed was too high for my "roller". Glass toppers on tables, etc. were easy to keep clean, but the dining table was not well attached to the base.I should have called about this, but did not get around to it. Kat was helpful about the parking, but we paid $20 daily until the first of the month, then a monthly rate. Do consult the ProPark attendants.Overall, a lovely place with helpful owners. We stayed for 7 days in condo 790 at illikai Marina in May. We had great time with wonderful bed and views. We had my 94 yr old mother with us and she enjoyed the stay very much. Fold out bed slept great and even had foam pad if needed for it. Really quiet and liked security all the time. Don't take Roberts from airport. They will not ley you off or pick you up their. Make you walk 2 blocks from Illikai Hotel. Drivers not friendly at all. Greeters for them at airport were great, but changed as soon as got in shuttle. Wonderful tours through Discover Hawaii tours. Quiet there just like home and you can use Hilyon lagoon and beach to swim. It's only about 3 minute walk away. Enjoyed fireworks from Hilton on three nights from our balconey. Walked everywhere even to Walmart by ala Mona Mall only about 10 minutes. Abc stored very expensive worth the walk and they have bags in room to carry groceries back. Resteraunts everywhere with McDonalds only one block if u have children. Boards, swim equipment, chairs and beach equipment there to use. Very safe area and beautiful view if you like boats. Liked watching yachts come and go. Great price and great place to stay especially for older people. We stayed in this Condo for 6-nights and really enjoyed it. The apartment is exactly as shown in the pictures. The view from the 7th floor overlooks the quiet Ilikai Marina with beach views in all directions. The unit is clean and secure with friendly locals. Beaches are within walking distance. We rented bikes and rode to Waikiki beach everyday. There are restaurants and a small market nearby. The local Walmart has a grocery store. The owner was very easy to work with and everything was exactly as she said in her emails. She was very responsive and provided good advice. Here are a few suggestions:1. The City Bus is very easy to use and tourist friendly. We used it to go to the Pearl Harbor Memorial and the airport. Pearl Harbor is free but tickets should be reserved in advance. We did not get a tour and didn't need one. Everything is self-explanatory. 2. Bicycle rentals were a lot of fun and made for easy access to the activities around the condo.3. Ilikai Park & Beach is a great place to stand up paddle and snorkel. The protected beaches offer the beginner a great place to see turtles and fish. The location of the condo is perfect. It is just outside the noisy part of the waikiki, but close enough to have easy access to all the actions in waikiki. The condo itself is clean and well equipped. It overlooks the harbor and the ocean. I love sitting on the balcony and watching sunset. Parking is $20/night, which is not cheap. But good luck finding cheaper parking in waikiki. Modern, well stocked vacation base. Easy reservation scheduling. Clear instructions. The condo was very well furnished, spacious, and very clean. Well decorated, comfortable and contained all of the items needed for a Hawaiian vacation. Location was very convenient. Convenient parking. Easy in and out for destinations. Nice view of boat harbor and ocean. Least: bar downstairs. Best: Location, location, location. Well maintained and clean. Very secure and convenient door locks. Thank you for your nice review. We are so pleased you enjoyed our condo and hope you come back again soon! Nicely located across road from the Marina so view of the boats and water is relaxing. Close to walk to Alo Moana mall and 2 minutes walk from where the Trolley bus picks up. Also if renting a car, the Alamo/National office is across the road. The apartment has everything you need for a comfortable stay. Nice pressure in the shower. Much nicer than staying in a hotel as the kitchenette was handy for breakfast. Place was clean. (altho the aircon vents could do with a brushdown). We normally always stay self catering but in Honolulu, dont think it is really worth it (for 2 persons) as eating out is cheap compared to back home in Australia and groceries are expensive ie. AUD$4 for 1.8L milk, $4.25 for 250g cheese about the same for butter , sugar also expensive....I guess because it is an island, most things have to be flown or shipped in. If you are a family of 3 or 4, then it could be worth it. There is a Red Lobster downstairs and a nice buffet if you want to try a variety of foods at the Hawaiin Prince 2 hotels down towards the Ala mall. $45 - but worth it. It was also a nice walk home after eating out in Waikiki, along the beach and you also get a good view of the Friday fireworks at the Hilton. If I went again, would stay again. Condo 790 had everything we needed for our stay. Kitchen was full of tools to prepare any kind of meal we wanted. Location was great, parking convenient as we could drive up to the 7th floor and just walk to the condo, great ocean view, and very quiet. Thank you Gillian and Vlad!!! We are so happy you enjoyed your stay. Come back again! When I was doing research for our Hawaiian vacation and read all the glowing reports about Ilikai Marina Condo 790, I thought they had to be phony...nothing could be that good...had to be friends of the owner. Well, I was wrong...I also have no connection whatsoever with the owners. The place is truly as advertised...comfortable, great location, very reasonably priced, beautiful view, clean, and everything was easy about the rental. We also appreciated that the entire building was clean and maintained (clean garage, walkways, etc.) All the amenities were provided (beach chairs/towels/kitchen stuff/linens/laundry facilities/etc.) If you rent a car, you park on the same level as the condo although a bus stops right in front of the building and the touristy pick up place is 3 minute walk away. You see the Friday night fireworks from the balcony (although it is very small, two people can sit, drink, and observe the happenings.) You are high enough to see over the marina and see the ocean and amazing sunsets. Can't think of a better stay for the two of us. Thank you for the great review. We really got a laugh of you thinking beforehand our reviews were rigged! So glad you found out for yourselves! We look forward to your return visit. Having stayed here for 5 days, I could not understand why some people stick to hotel as accomodation in Hawaii. If your itinerary is just to stay in one place and will not go out of it, then luxury resort would be an answer. But if you want to enjoy attractions in Hawaii and to stay at peaceful accomodation, you should not miss this condo! Location, Parking, Cleanliness... Everything's perfect.You can get full ocean-view even in the kichen and don't have to go to Sunset Beach just to see sunset. On every Friday, Hilton will give fireworks to your lanai! Thank you for your great review. It is great staying in 790, we completely agree! Come back again soon. We are happy you enjoyed your stay and look forward to you and your daughter coming back again soon. Great location, nice view, spacious and well furnished space. Absolutely wonderful find. I would recommend this spot to anyone looking to be close to Waikiki but also out of the fray. Thank you for your kind words. We love our condo and we are always so pleased when guests enjoy it too. We were very impressed with the condo and the service was exceptional!! We loved the view of the marina, the convenience of restaurants, walking distance to shopping, and we received very prompt help when we had just one small problem! All through our process of renting the condo and planning our vacation, Vladimir & Gillian were great to communicate with and extremely helpful! This condo was lacking in nothing! Everything is provided for a very enjoyable vacation and nothing to worry about for accommodations!! We liked the location to the beach-a very short walk, and everyone was sp friendly in the comlex! We will be in touch with this vacility and hosts again when we come back!! I honestly cannot think of anything we did not like, other than the facility does not have a swimming pool, but that is just for the occassion you may want to stay away from sand and ocean--that doesn't happen very often!! Thank you for making our stay very comfortable, relaxing, and in need of nothing other than us buying our food!! We loved it!!! Awsome location and ocean/marina views to die for!! You can't go wrong with this lovely 1 bedroom condo. Dealing with both Kat and Gillian was wonderful, they respond to inquiries and questions lighting fast. It is very tastefully furnished through-out, clean and comfortable. The king bed is one of the finest we have slept on, I think better than home. And although we didn't need it, there is a queen sofa bed for additional guests. No hastle check-in, management is just a phone call away if needed. We had one small issue when the power to the building went out on our first morning but, got through it o.k. There are several very nice restaurants below and around the corner, Chart House, Outback Steak House, Red Lobster, and be sure to drop into the Harbor Pub below, the help is in the true aloha spirit. That is great you had a good time and enjoyed the condo. We look forward to you coming back soon again! I've been to Oahu 26 times and this was the first time not staying with relatives. #790 was like being home. 790 is a great unit, fully equipped, well located, and had a great view, and a very reasonable price. Condo or hotel? Condo is the way to go. Everything you need is here. Close to Waikiki but far enough to avoid the craziness. Resrevations and check in were a breeze. Gillian, Vlad, and Kat are qiuck to answer questions and guide. I stayed for 2 weeks and had a mid-stay house cleaning. Housekeeping did a great job and even folded clothes we had left out. The parking garage is attached and runs $20 a day. Pay ahead and save some hassle. $20 a day for parking in Waikiki is a steal. The unit is close to ala Moana Mall, nice beaches, and easy access to H1 and touristy locations. We love Oahu and will be reserving #790 again. Thanks to Gillian and Vlad for a great vacation. We are so happy you enjoyed the condo and had such a great time. We look forward to your return. My daughter and I enjoyed our time in Waikiki and felt the time went quickly, although we did visit Molokai for a few days which was wonderful. Our stay in Condo 790 was perfect, it has all the conveniences of home which was tastefully decorated. To top it off we were able to drive to the 7th floor to the unit, very convenient especially when we needed to unload luggage and goodies, which shopping was very close by. The location was perfect and the view awesome. Thank you Vlad & Gillian it was perfect! We are so pleased you had such a good time. Come back again! We thoroughly enjoyed our stay here, the sounds of the birds and the green and flowers all around the holiday home were great. Our daughter was very comfortable on the sofa bed. It was easy to walk over to the beach as well as to town. Lots of natual light, comfortable, has most of the conveniences you'll need... Needs better light in the bedroom for reading at night... Easy access...and close to Morimoto's restaurant, which you don't want to miss because the food is delicious... All in all, a fine vacation and very comfortable stay. We spent 7 nights in Condo 790 and it had everything we needed. I agree with others that the no key combination lock is a bonus. the views were lovely, plenty of room for the two of us and while the kitchen is dated- it has everything you need and the condo was very clean. Great location out of the full on bustle of Waikiki and great to be near the shopping centre, bus and eateries. We loved our walk down to the beach. We think this condo is excellent value for money and had a great time. The cupboard with all beach gear, tennis rackets etc was a plus. wi-fi and local phones calls were also included. We are so glad you enjoyed your stay. Come back again! We thoroughly enjoyed our stay. It was attractive and homey with a fantastic view of the yacht harbor and ocean. We walked to beaches and restaurants. We would definitely stay there again. This condo is in a great location at the west end of Waikiki within walking distance of beaches restaurants and shopping. It has a beautiful view of the the Ilikai Marina and sunsets. Condo 790,like all the Marina condos, faces directly out to sea at the water's edge, whereas the main Ilikai building faces out diagonally. There is nothing like waking up and seeing the full ocean panorama at sunrise. The Marina is ideally located between Waikiki beach and the ala Moana park and shopping center. 790 is well-equipped and well-maintained. Owner's emails helped us to locate the Marina and move in after a late-evening arrival. You will notice that 790 has a better combination door lock than other condos on the floor - it eliminates the hassle of a lockbox and separate key when you walk back to the condo with an armful of groceries from the nearby Foodland supermarket. We would happily return to 790 for another stay in the future. The condo was nice and comfortable. We had plenty of room for 4 people and the sliding wall separating the bedroom from the living area was perfect for a kid's earlier bedtime. The location was wonderful as it was located a short walk to the Hilton lagoon and a nice beach. A short walk to a bus was a nice option when we went to the aquarium and a 1-day car rental was close when we wanted to explore more of the island. There were a couple of very small cleanliness issues that need improvement such as replacing musty-smelling small kitchen rugs. For my stay, I simply put the rugs in the cleaning closet and left a note for the cleaning staff. Overall, the condo was a great fit for our family. The condo is situated overlooking a beautiful boat harbor. It is very clean and comfortable. It has all the comforts of home. It is close to the beach, shopping and restaurants. We had a terrific vacation and would definitely stay here again. Had a great time! The location of this unit is perfect for beach, shopping, restaurants, and the view is wonderful. The staff we met were very helpful, and the unit itself was all we needed.The kitchen is a bit tired and needs updating and better lighting. The sofa is done and needs replacing. Rooms were clean and the bed was fantastic want to go out and buy one like that. Friday night fireworks was great for my grandson. Will be back again soon. The only reason I did not rate this 5 Stars Overall is because the balcony is so tiny that it was barely large enough for the two small chairs placed on it. We would have loved to have been able to lounge outside. Otherwise we were very pleased with our marina/ocean view, location, and comfort. We would definitely recommend this site; the owners were very good to deal with. The condo is located in a quieter area of Waikiki and just a very short walk to the beach. Kids loved that it was soo close to the ala Moana shopping center! The condo was adequately supplied and the king size bed was great. This is a good, affordable alternative to a hotel if you want to cook a few meals and have some extra room. We were happy that the condo was everything that it was advertised as. It was very homey,clean and comfortable. When we first arrived my daughter noticed that the shower drain was plugged. We called management, and a plumber arrived and fixed the problem right away. The manager even called back later to check on the situation, which we really appreciated.We were on the island for our sons' wedding, and most of our family members stayed in nice hotels. We were quite happy with our decision to stay in the condo.The rent was very reasonable and we were able to fix some of our meals there.Our daughter and her friend said that the sofa bed was not the most comfortable, but they managed to sleep ok. My husband and I were very comfortable in the king sized bed.We really enjoyed the Marina view and the location in general. My wife and I came for a 5 day visit for our anniversary and very much enjoyed our short stay in unit 790. The location and view are outstanding! The bed is very comfortable as well. We have enjoyed this location (Ala Wai Marina) for many years because it is convenient to the activities of Waikiki, yet it is somewhat removed from the crowds and traffic. Added pluses are its access to parking right in the building and the short distance to the ala Moana Park and Beach area which are virtually "next door"! Comfort & Convenience with a Gorgeous View! The updated bathroom was great and also, the king sized bed was very comfortable! The reservations, check in, check out, etc was effortless! Definitely recommend this condo for those looking to stay very near, but not in Waikiki! Thank you for a wonderful stay! On the days mentioned above, my husband, adult daughter and I stayed in condo number 790. We were not excited to be in the business of Waikiki and so were very glad to find that your condo was in such a beautiful and quiet neighborhood. The parking garage was handy for in and out parking and oh. so convenient. The very best thing about the condo was how perfectly it was stocked and supplied. I can't imagine what we could have needed that wasn't provided for us. Thank you so much! If ever we are able to return to Oahu, we'll be in touch with you right away to secure a return visit to condo number 790 at Ilikai Marina. Our daughter left her camera and Mary found it and promised to send it to her. Of course we will pay for the shipping. Susan will be so glad to have her camera returned. She takes a lot of pictures and actually sees her vacation in more detail through her photography(she has very low vision). So many thanks to Mary for her kindness in finding a pretty important part of our happy vacation. Clean, fresh, well equipped, great location and view. The condo was clean, the bed comfortable,it had all the amenities needed in the kitchen and bath. The view was fabulous and we enjoyed being so close to beaches, shops and entertainment. The price was great as well. This tiny condo was perfect for us because we only sleep there, and enjoy walking to restaurants, beaches and parks. Too bad parking there is so expensive ($ 17.00 a day??) The kitchen could use a sharp knife or two for those of us who like to cook. Looked like they decided not to provide them because sommebody obviously used the formica counter as a cutting board. Beach towls and umbrella were a plus. Bathrooom remodel,impressive. Very quiet neighbors.Management needs to implement its well posted NO SMOKING policy to thr hired painters who worked all week when we were there and stunk up the parking garage which affected the hallways. It is a great location and view. It is walked from there by Ala Moana beach and Ala Moana Center. It is good condo of the comfort that can be relaxed very much. ?And very reasonable. We were able to enjoy Hawaii stay. Great location right on Waikiki! a quick walk to the beach and a fantastic view of the marina make this a great condo. we had a family of 4 and we all enjoyed the easy walk to beach along with all the amenities that waikiki offers. Service was great though we did not need much help as the condo had all the basics that one would want. The location was great, the condo was adequate.They definitely need a new sofabed, it was very old and uncomfortable.The main problem we had was the street noise,coming from the bar below and the garbage trucks very early in the mornings.The building is quite old and could use some updating.Seeing cockroaches when we came out of the stairwell on the main floor was rather gross, considering that is where the restaurants are located.We would likely stay there again, perhaps on a higher floor. The Ilikai Marina is in fact a quiet location. There is only a single lane access road separating the building from the beautiful Marina. The garbage truck comes and goes in the morning. If one is super-sensitive to sound the easiest way to avoid the truck noise is to shut the lanai door in the living room for that period of time. The bedroom is completely quiet if you shut the sliding door separating it from the living room. As the building is concrete construction there is no noise transfer between the units. For sleeping the sofa bed is not as comfortable as the King size Simmons Beautyrest bed in the bedroom. However as sofa beds go it is extremely comfortable as a day time sofa. Extra foam has been added to make it more comfortable for a good night's rest. The Ilikai Marina is always kept to a high standard of cleanliness. The ground floor has attractive landscaping, and is completely open to the outside, which is one of its charms. The building is treated for insects on a regular basis. we are traveling with a baby and condo is great choice for us because we can cook or heat some simply food for baby and us. The condo has great view, we love to see the sun in the morning and sun set in the afternoon. we love this condo! We were very impressed with the quality of the accomadations and the location of the condo. We visit Honolulu for an annual business conference and we will definitley try to reserve the condo again for next year. Gillian and I have stayed in our condo for little over two weeks. It was our first chance to fully enjoy the condo after we bought it in May 2009 and completely renovated it. The weather was great and every morning we went to the beach in front of the Hilton for a long swim. This beach is probably the best swimming beach in Waikiki. We managed to view three sets of Friday fireworks from our lanai. Our condo experience fullfilled our dreams and expectations. We found everything to be just as advertised. This was our second time staying at this condo, and it met our needs perfectly.We were within walking distance to everything, or we could hop a bus.We had a wonderful view of the ocean and Marina. The bed was so comfortable, just like home. We liked being able to get our own meal if we so wished. The kitchen was well stocked with everyhing we could every need. It truly felt like a home away from home, and help was only a phone call away if we needed anything. Location is great. Can walk to events, fireworks, beach rentals, and boat harbor. Good restuarants and stores nearby. Secured parking garage is very convienent.Worked great for us and a seven year old. well equiped condo. At first sight the suite looked great, comfortable and clean. Then we found some small bugs racing around the kitchen counter the next day. A couple of days later we saw a cockroach on the kitchen wall. We told the manager of the building and she gave us some bug traps which did nothing to get rid of them. We decided we would just avoid the kitchen and not let these critters spoil our vacation. After we came home we sent photos which we had taken of those bugs to the person/company that we had corresponded with to secure the rental suite. No real apologies came back. My advise to to find out if they did anything to the bug problem since November of 2007. The condo is now under new ownership and management. In the summer of 2009, the condo was completely renovated with all new furniture, new flooring, a new kitchen and a new bathroom. There has not been any evidence or reports of bugs this year (2009). We've stayed in this unit for a week and had a great time. The location is perfect, the view is beautiful. Parking is not a problem, we always found a spot in the free area nearby but if you don't, you can park in the attached garage for a fee. Waikiki beach area is walking distance, shops are walking distance. This is just a great little place to stay if you do not want to stay in a hotel or you want to save a little money. The unit is a bit outdated but clean, comfy and nothing was broken. You will find everything in the kitchen what you need for cooking. Bring beach towels though since those in the unit are small and not the best quality for water absorbtion. We highly recommend this unit to stay in, and we will deffinately return one day!! !